I guess you could say I'm deep in the trenches of this journey right now. I've been doing this for two months and it hasn't gotten any easier. I want to tell everyone that I march into the hospital ready to battle cancer like a superhero. But, I don't. It's hard to come in fighting, knowing how horrible you're about to feel, even if you do know it's saving you. 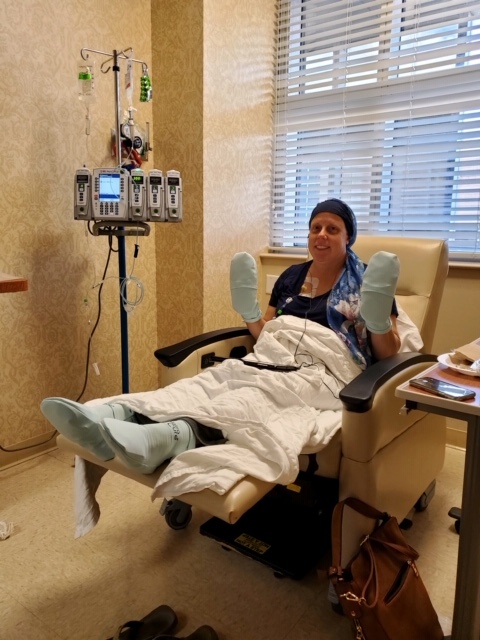 I finished the 4 rounds of AC chemo and started the 12 rounds of Taxol this past Friday. Yes, TWELVE rounds. This time, I'm going weekly and it's supposed to be more mild than the "red devil" I was receiving before. So far, I have felt less nausea and didn't spend the weekend puking, which is a major win. The most common side effect from this drug is neuropathy, which can be permanent. I'm super paranoid about it, so every tingle I feel I'm monitoring like crazy. My Oncologist told us about a recent study which found that cryotherapy (cold) could help prevent some of the neuropathy. So, when I go in for my treatment, I have to wear these frozen gloves and socks. It was brutally uncomfortable, but if it will prevent the neuropathy, I'll keep doing it. What other weird side effects am I having? Well, a strange combination of fatigue and insomnia. Weird, right? I'm beyond tired, and have zero problems falling asleep, but staying asleep is impossible. I'm waking up every night around 3 or 4 and I'm just lying there until it's time to get up. Thanks to the Taxol, the hot flashes have started and they are horrible, all the sudden you feel flushed and are drenched in sweat. You have to stop whatever you're doing and just sit down. If I don't sit down, I feel like I'll faint immediately. In my case, I have to rip off whatever head cover I have on to get the hot flash to pass. Then, once it passes, I'm freezing because I'm covered in sweat and sitting on a cold floor or under an air conditioning vent. I don't know how I will handle these hot flashes as the brutal Florida heat approaches. My appetite has definitely decreased, which means I'm not eating much. Honestly, I don't mind this side effect because it has put a stop to the weight gain and bloat I was feeling before. I'm generally not hungry, but because my anxiety is out of control, I always have this anxious feeling in my stomach. It's a constant butterflies-in-the-stomach feeling. The fact that I'm not eating much is probably contributing to the general weakness I'm feeling. My arms and legs in particular feel very heavy and become sore very quickly. So, that's my latest update. I hate that I'm just complaining about how lousy I feel in these posts. In real life, I feel like I'm always putting on a brave face and "hanging in there", so it's nice to have some place to come and vent. Virtual big ! Hang in there! You're doing great! In addition to being cathartic, I'm sure your blog will give another woman a realistic yet hopeful view of this process. I think that, is both helpful and beautiful. Being honest is the best for you! You are brave just being you! Big hug! Love from Moira and me!